The Mid-Atlantic, also called Middle Atlantic states or the Mid-Atlantic states, form a region of the United States generally located between New England and the South Atlantic States. Its exact definition differs upon source, but the region usually includes New York, New Jersey, Pennsylvania, Delaware, Maryland, Washington, D.C., Virginia, and West Virginia. When discussing climate, Connecticut is sometimes included in the region, since its climate is closer to the Middle Atlantic than the New England states. The Mid-Atlantic has played an important role in the development of American culture, commerce, trade, and industry. Left-right from top: Manhattan skyline, Independence Hall in Philadelphia, Assateague wetlands, Panorama of Philadelphia, Catskill Mountains, Pittsburgh skyline, Panorama of Washington D.C.
States in dark red are included in the Mid-Atlantic and Northeast region, while states in pink are included in the Mid-Atlantic and Southeast region. In the late 19th century, it was called "the typically American" region by Frederick Jackson Turner. Religious pluralism and ethnic diversity have been important elements of Mid-Atlantic society from its settlement by Dutch, Swedes, English Catholics, and Quakers through to the period of British rule, and beyond to the current day. After the American Revolution, the Mid-Atlantic region hosted each of the historic capitals of the United States, including the current federal capital, Washington, D.C. In the early part of the 19th century, New York and Pennsylvania overtook Virginia as the most populous states and the New England states as the country's most important trading and industrial centers. Large numbers of German, Irish, Italian, Jewish, Polish, and other immigrants transformed the region, especially coastal cities such as New York City, Newark, Philadelphia, Baltimore, and Washington, D.C., but also interior cities such as Pittsburgh, Rochester, Albany, and Buffalo. New York City, with its skyscrapers, subways, and headquarters of the United Nations, emerged in the 20th century as an icon of modernity and American economic and cultural power. By the 21st century, the coastal areas of the Mid-Atlantic were thoroughly urbanized. The Northeast Corridor and Interstate 95 link an almost contiguous sprawl of suburbs and large and small cities, forming the Mid-Atlantic portion of the Northeast megalopolis, one of the world's most important concentrations of finance, media, communications, education, medicine, and technology. The Mid-Atlantic is a relatively affluent region of the nation, having 43 of the 100 highest-income counties in the nation based on median household income and 33 of the top 100 based on per capita income. Most of the Mid-Atlantic states rank among the 15 highest-income states in the nation by median household income and per capita income. The Mid-Atlantic is home to some of the most prestigious universities in the nation and world including Columbia University and Princeton University, which rank among the top 3 universities in the United States and top 10 universities in the world. A USGS fact-sheet interpretation of the Mid-Atlantic in terms of groundwater. An 1897 map displays an inclusive definition of the Mid-Atlantic region. There are differing interpretations as to the composition of the Mid-Atlantic, with sources including in the region a number of states from New York to South Carolina. A United States Geological Survey publication describes the Mid-Atlantic Region as all of Maryland, Delaware, the District of Columbia, Pennsylvania, and Virginia, along with the parts of New Jersey, New York, and North Carolina that drain into the Delaware and Chesapeake Bays and the Albemarle and Pamlico Sounds. Sometimes, the nucleus is considered to be the area centered on the Washington metropolitan area, including Maryland, Virginia, Delaware, and West Virginia. Virginia and especially West Virginia, are atypical of this region in a few ways. They are the only states to lie primarily within the Southern American dialect region, and the major religious tradition in both states is Evangelical Christian, 30% in Virginia and 39% in West Virginia. Although a few of West Virginia's eastern panhandle counties are considered part of the Washington, D.C. MSA, the major portion of the state is rural, and there are no major or even large cities. Shipping and trade have been important to the Mid-Atlantic economy since the beginning of the colonial era. The explorer Giovanni da Verrazzano was the first European to see the region in 1524. Henry Hudson later extensively explored that region in 1611 and claimed it for the Dutch, who then created a fur-trading post in Albany in 1614. Jamestown, Virginia was the first permanent English colony in North America, it was established seven years earlier in 1607. From early colonial times, the Mid-Atlantic region was settled by a wider range of European people than in New England or the South. The Dutch New Netherland settlement along the Hudson River in New York and New Jersey, and for a time, New Sweden along the Delaware River in Delaware, divided the two great bulwarks of English settlement from each other. The original English settlements in the region notably provided refuge to religious minorities, Maryland to Roman Catholics, and Pennsylvania to Quakers and Anabaptist Pennsylvania Dutch. In time, all these settlements fell under English colonial control, but the region continued to be a magnet for people of diverse nationalities. The area that came to be known as the Middle Colonies served as a strategic bridge between the North and South. The New York and New Jersey campaign during the American Revolutionary War saw more battles than any other theater of the conflict. Philadelphia, midway between the northern and southern colonies, was home to the Continental Congress, the convention of delegates who organized the American Revolution. 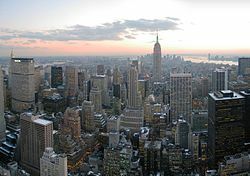 The same city was the birthplace of the Declaration of Independence in 1776 and the United States Constitution in 1787, while the United States Bill of Rights was drafted and ratified, and the first Supreme Court of the United States sat for the first time, in the first capital under the Constitution at New York City. While early settlers were mostly farmers, traders, and fishermen, the Mid-Atlantic states provided the young United States with heavy industry and served as the "melting pot" of new immigrants from Europe. Cities grew along major ports, shipping routes, and waterways. Such flourishing cities included New York City and Newark on opposite sides of the Hudson River, Philadelphia on the Delaware River, and Baltimore on the Chesapeake Bay. Note: The Mid-Atlantic region is also home to the nation's capital, Washington, D.C.. Notable golf tournaments in the Mid-Atlantic include the Barclays, Quicken Loans National and Atlantic City LPGA Classic. The US Open, held at New York City, is one of the four Grand Slam tennis tournaments, whereas Washington Open is part of the ATP World Tour 500 series. Notable motorsports tracks include Watkins Glen International, Dover International Speedway and Pocono Raceway, which have hosted Formula One, IndyCar, NASCAR, World Sportscar Championship and IMSA races. Also, the Englishtown and Reading drag strips such have hosted NHRA national events. Pimlico Race Course at Baltimore and Belmont Park at New York host the Preakness Stakes and Belmont Stakes horse races, which are part of the Triple Crown of Thoroughbred Racing. Wikivoyage has a travel guide for Mid-Atlantic. ^ "State & County QuickFacts". US Census Bureau. Retrieved 2009-04-09. ^ "News Release: GDP by State" (PDF). Bureau of Economic Analysis. Retrieved 2009-04-16. ^ "Middle Atlantic states - region, United States". Britannica.com. Retrieved 2 November 2017. ^ "United States". Encyclopædia Britannica. 2009. Retrieved 2009-04-09. ^ "National University Rankings". U.S. News & World Report. Retrieved December 28, 2018. ^ "Best Global Universities Rankings". U.S. News & World Report. Retrieved December 28, 2018. ^ Earl A. Greene et al. "Ground-Water Vulnerability to Nitrate Contamination in the Mid-Atlantic Region". USGS Fact Sheet FS 2004-3067. 2005. Retrieved 25 April 2013.Note: Although the locator map appears to exclude part of northwestern Pennsylvania, other more detailed maps in this article include all of the state. ^ "Merriam-Webster". Merriam-webster.com. Retrieved 2017-08-30. ^ Earl A. Greene et al. "Ground-Water Vulnerability to Nitrate Contamination in the Mid-Atlantic Region". USGS Fact Sheet FS 2004-3067. 2005. Retrieved 25 April 2013. Note: Although the locator map appears to exclude part of northwestern Pennsylvania, other more detailed maps in this article include all of the state. Often when discussing climate, southern Connecticut is included with the Middle Atlantic. ^ "Word Net Definition". Wordnetweb.princeton.edu. Retrieved 2009-04-09. ^ "U.S. Census 2000 Report" (PDF). Census.gov. Retrieved 2 November 2017.